On October 4th 2018 Capita Translation and Interpreting (Capita TI) kindly sponsored and hosted our W.L. UK Quarter Three event in their beautiful new offices in central London. The topic was global e-commerce, from the viewpoint of our three fabulous guest speakers, presented in a relaxed and informal environment where we could meet fellow women (and men) in the localization industry. Here’s how the evening unfolded. As with previous Women in Localization events, we kicked off with some drinks and nibbles and a chance to network and mingle. 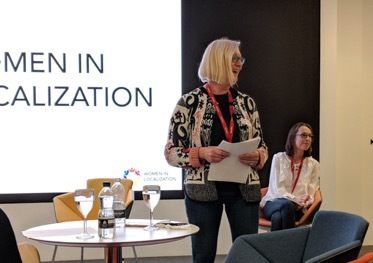 After introducing our sponsor and learning about Capita TI’s extensive range of services, our Chapter Manager Inger Larsen explained the background and purpose of Women in Localization. We’re here to support women and help them progress their localization careers. This event is just one of the many ways in which we hope to achieve our goal. And the topic global e-commerce was chosen from our Facebook poll where we asked you what areas you’d like us to focus on. Our first speaker on the topic was Laura Pearmain. Laura is a Solutions Architect at Capita TI. She gathers customer localisation requirements and recommends different technologies to meet them, and contributes to efficiency improvements across the business. Laura gave us great insights into the nuts and bolts of global e-commerce. Beginning with explaining what it is, she went into detail on how it works – and how to ‘get it right’. Localization is key – customers want to buy in their own language. But there are various ways (and technologies) to make sure the local language content is served up quickly and accurately. You should think about how much local adaptation or additional content you may want to add, as this will impact your CMS selection – and how you’re going to get the local content in and out for localization. Technology is crucial for achieving both speed and consistent quality. Having got to grips with the localization agency side of things, it was time to hear from Rachel Ball. Rachel is the Translations Manager (EMEA) for Ralph Lauren but had previously worked at a translation agency. We were keen to hear about her transition to the client-side challenges of global e-commerce. Handling high volume and repetition, while remaining accurate, excellent and true to the brand were some of Rachel’s daily challenges. As well as planning upstream and being mindful of hard (seasonal) deadlines that were often squeezed with localization being the last stage in the process. Ralph Lauren’s goal is to be ‘omnichannel’, providing customers with a seamless experience from online to offline; desktop, mobile, phone or real store. Localized content has to therefore be scalable, consistent and resonate on all channels – for each and every customer. Last but not least, Semra van der Linden (a Product Manager on Expedia’s Market Expansion program) took the stage and told us a little about Expedia’s approach to getting e-commerce off the ground in non-traditional emerging markets, including the Middle East and Latin America. Agreeing completely with our previous two speakers, regarding not only the processes and people involved, but also the value of localizing e-commerce content, Semra also spoke about the very real (and commercial) need for speed. Locally nuanced language and content are the ‘holy grail’ but Expedia will launch with MVP (minimum viable product), scrutinise performance, measure ROI and then evolve the product offering and localization in line with local requirements. Good advice to agencies when proposing solutions to clients – listen to their commercial objectives and tailor a solution that will grow with your client’s ambitions and tactics. After opening up the floor to questions from the audience, we brought the speaker section of the evening to a close and continued to mingle and chat over drinks and nibbles. People started to head off at around half nine, brimming with new ideas for global e-commerce and delighted with the new contacts they’d made. 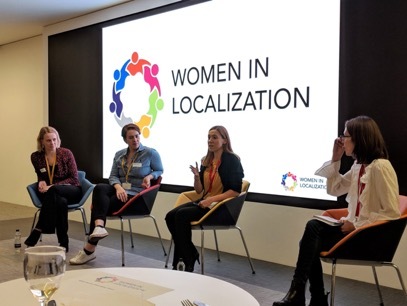 Our next Women in Localization event is going to be in the New Year and the topic is Machine Translation. Drop us an email if you’d like us to keep you up-to-date with the details. Looking forward to seeing you there!